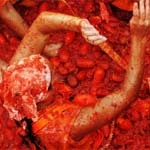 Thousands of tomatoes are "sacrificed" every year in Buñol, a small town in Valencia's province. This celebration has been named the world's biggest food fight! Get ready for the digestion! Every year on the last Wednesday of August, Buñol -a small town 30 km away from Valencia- hosts La Tomatina, the world's largest food fight. The fight is the culmination of a week-long celebration that includes many festivities, like parades, fireworks, food fairs and street parties, in a fiesta that coincides with the town's patron saint. The whole thing started by sheer chance in 1945, when some of the youngsters of the town tried to take part in the Giants and Big-Heads parade that was being carried in honour of the town’s patron saint. In an act of frustration, they started trying to open way among the gathering crowds, making one of the participants fall to the floor. The man, angered by this started hitting everything around him. Fate wanted it to be a vegetable stall next to him, and the brawling crowd started a spontaneous tomato fight. The next year the fight was already staged and carried out voluntarily, forcing the authorities to dissolve and ban it. Many cancellations followed, until in 1957 the locals celebrated the Burial of the Tomato as an act of protest: a huge funeral procession in which a tomato was taken to burial inside a coffin, which finally forced the local authorities to acknowledge the tomato fight as a town’s celebration. From that year on, the party has grown bigger every year in participants and fame, both inside and outside of Spain, and has been declared a Fiesta of International Tourist Interest. Today, around 20,000 people take part in the celebration. The different events on the days prior to the fight include a paella contest near the town’s square, site of the imminent battle, tomato fireworks, and different music bands and parades around the medieval city centre. Then, on Wednesday morning, the first main event before the big tomato battle is the “Palo Jabón”, a long greased pole with a ham on its top. The aim is to climb up the pole and make the ham drop, which is tried by many brave youngsters. Meanwhile, on the ground, people sing and dance in circles, and cool themselves with water hoses. About this time too, a truck packed with the squishy veggie blobs enters the action. Once the ham falls, the first signal for the tomato scrimmage is set off. This usually happens at around 11 in the morning, and for the next hour the town’s main square transforms into a red-stained battlefield. There are some rules to be followed, though, which are: squashing the tomatoes before throwing them, to minimize the impact; no other projectiles are allowed; participants must make way for the trucks; no T-shirt ripping is allowed; after the second signal to end the battle, no more tomatoes should be thrown. 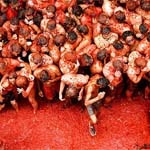 After the 90,000 pounds of tomatoes have been hurled, the participants head down to the river, where they will wash away the pulp and seeds on their hair and body leaving behind them a red stained town square. The fame of La Tomatina has grown so big that in many other cities in Colombia, Costa Rica, Chile, China and the United States organize similar events, and even the videogame Tekken has included a scenario in its 6th edition that mimics the Tomatina.